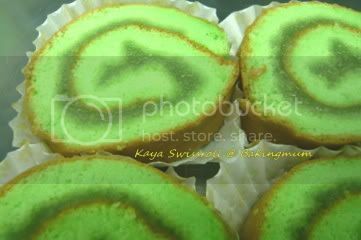 I have been contemplating making kaya swiss roll since last week. Finally managed to grab a jar of kaya from NTUC to make this tonight. Very soft and nice. Going to bring to the office to share with my colleagues. hmm...delicious. i tot of making this also but haven't make my kaya. will make kaya first then this. Hi Delia, I prefer homemade kaya because you can control the sweetness of the kaya. But I have no time to make so I bought it from the supermarket and I think it is really sweet. 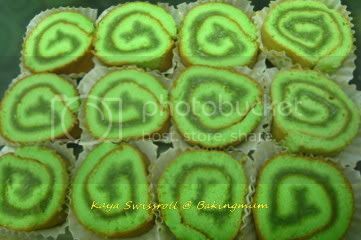 Hi Lara, actually I used the same swiss roll recipe that I have posted before and just added 1 tsp of pandan paste. The cake is quite soft to be roll up nicely. What do you mean by bad? Did it break or too dry or what?